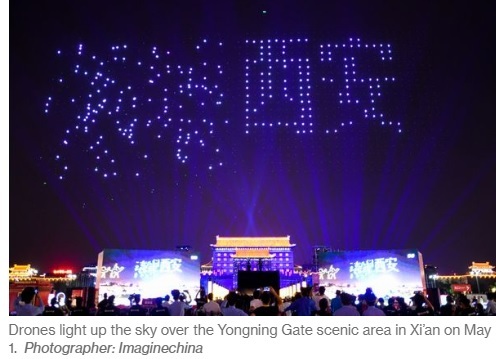 Business Strategy in Asia-Pacific Drone Swarms Are the New Fireworks Lighting Up China's Skies Since China banned fireworks across more than 400 cities to reduce pollution, a new entertainment has emerged to fill the skies: drone swarms. Shows featuring more than a thousand drones forming 3-D animated figures and other images are being booked for celebrations across the country. Among those cashing in on the technology is EHang Inc., which has been contracted for several performances and in the process set a record for the number of airborne craft in a single display. While the Intel performance at PyeongChang was pre-recorded, EHang has performed for live audiences. Some drones failed to stay in formation during parts of Ehang’s record show and Xiong said the issue may have been due to man-made interference, but declined to provide details. Founded by Duke graduate Xiong and his partner Huazhi Hu in 2014, Guangzhou, China-based EHang raised $42 million in a Series B round the following year with investors including GP Capital, GGV Capital and ZhenFund. EHang’s drones aren’t the only ones getting attention. When state broadcaster CCTV held its annual Spring Festival Gala, the world’s most-watched TV show, it featured Zhuhai-based Oceanalpha’s performance of 80 boat bots. 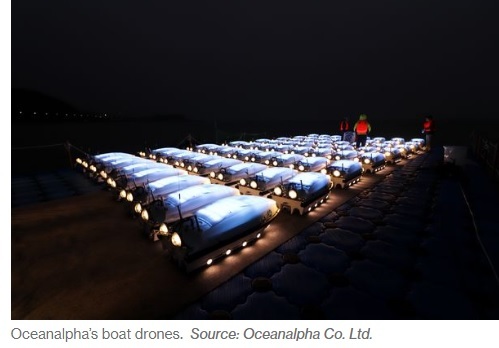 Oceanalpha’s boat drones.Source: Oceanalpha Co. Ltd.